Kids need and deserve paint!!! The only problem is, even when they are older, children are not very neat artists. Recently, I was surprised at how much paint my daughter had all over her hands, and she is ten-years-old! Since our skin absorbs toxins, it is very important children use quality, natural art supplies, as you know they will be wearing them! Even though paints designed for children come with “non-toxic” assurances, that certainly does not mean they are natural. Likewise, “all natural” does not mean non-toxic. Originally paint was made from pure pigment found on Earth. In fact, there are still windmills in Holland used for grinding paint pigments. This traditional process is behind Earth Paint. Earth Paints for Children – Petite is an organic, eco-friendly paint kit made from primarily natural earth pigments (pure clay). The naturally colored clay was collected from the ground, dried, crushed and sifted into pure pigment. Mix water with these six powdered colors to create a creamy paint similar to tempera or add more water to create watercolor like effects. It is different from other children’s paint in that it is a high quality, rich, vibrant paint that is free of fillers and preservatives. It is perfect for adults as well to create quality works of art on paper, stones, fabric, wood and more. My kids really like mixing their own colors from the powders, and I think it really helps kids understand the origins of paint to work with powdered pigments. It helps us connect to our cave dwelling artistic roots! In fact, for older students, Earth Paints can be included in history lessons. Natural Earth pigments were among the earliest recorded materials used by our ancestors to make paint, and their use pre-dates recorded history. Starting at least 100,000 years ago, ancient people from all over the world, including Egyptians, Native Americans, ancient Buddhists, Medieval monks, and Renaissance masters used earthen pigments to make their paints. Humans on almost every continent ground up earthen clays and minerals and mixed them with a binder such as honey, urine, blood, sap, grease, or oil. This basic technique, with numerous variations, became the prevailing method of oil painting until the Nineteenth century’s introduction of synthetic pigments and petroleum-based paints. Such a lesson in ancient art history would be perfect for homeschool, as well as the classroom! Earth Paints would also be a great source for lessons in geology learning about the natural sources for the pigments. I would love to try the Earth Oil Paint Kit myself! 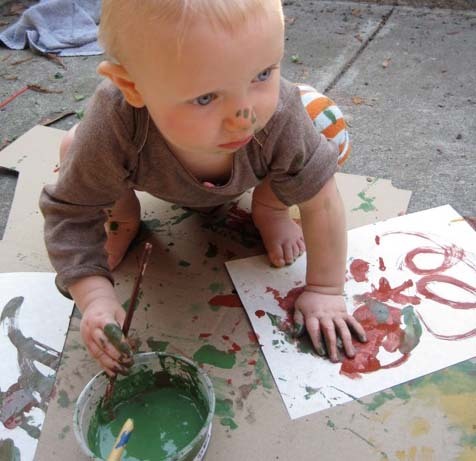 Getting messy is half the fun of art! These look like another great option for paint and I love the history lesson too!